Home / Recaps / Porzingis explodes as Knicks win their 4th straight! Porzingis explodes as Knicks win their 4th straight! 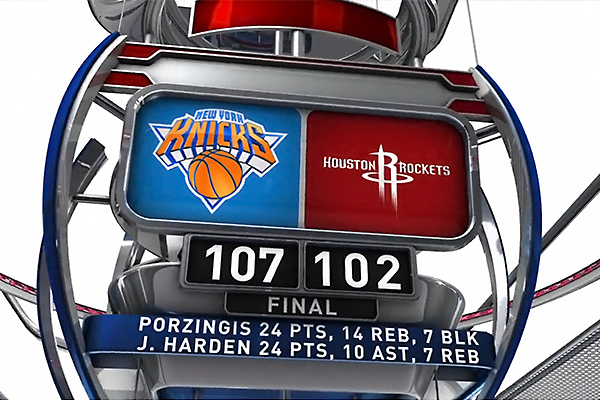 The New York Knicks continue to impress as they win in Houston for the first time in 11 years (107-102), improving to 8-6 and get road back to back wins since who remembers when. Kristaps Porzingis, the rookie who got so little love back in the summer after he was drafted as the 4th overall pick, is making loud noises throughout the entire league, receiving comparisons to Dirk Nowitzki as he proves to be one of the most solid picks. Porzingis came close to his first triple double of his career as he finished the night with 24 points, 14 rebounds and a career high 7 blocks. According to the New York Times, he’s the first 20 year old to post his specific statistical line in a single game since Shaquille O’Neal 22 seasons ago. The Rockets, who played without Dwight Howard and are now 1-6 in their last 7 games, found little resources in stopping the Knicks’ rookie to score, as no one from the Harden – Ariza – Jones triplet could annihilate Porzingis’ jumpshots. The Latvian shot 8-12 from the field, including 2/3 from long distance and was flawless from the free throw line (6/6). Carmelo Anthony who had 16 points and 6 rebounds spent little time on the floor, just under 25 minutes as he got into foul trouble. Arron Afflalo scored 16 points and grabbed 6 boards but his return to action is putting a mark on Jose Calderon who’s been a completely revamped player after a sloppy season start. Calderon overcame the early season critics and he’s been a consistent presence on both ends of the floor. He ended with 11 points and 7 assists. Langston Galloway and Lance Thomas combined 20 points coming off the bench while Jerian Grant and Derrick Williams added 6 points each. It seems like Derek Fisher has figured out a rotation that confirms by the game as his team wins their 4th straight game and are headed to Miami to face their rivals on Monday night. What’s your take on the game?